For the penultimate blog post in our Light Night’s series, we head to the eastern side of the River Kent and explore Wildman Street, Castle Street, Aynam Road and beyond. From Kendal town centre cross the River Kent using one of Kendal’s five bridges and you will come to the eastern side of the river; where you will find Kendal’s train station, the grand Parish Church of Saint George and where a picturesque walk will lead you to Kendal Castle. Alongside these cultural delights, this area of Kendal is also home to an assortment of great restaurants and bars, read on to explore the offering and make the most of the long summer evenings in our vibrant town. One of Kendal’s most famous features is the River Kent and what better way to spend a sunny evening than sipping a cool glass of wine overlooking the river. 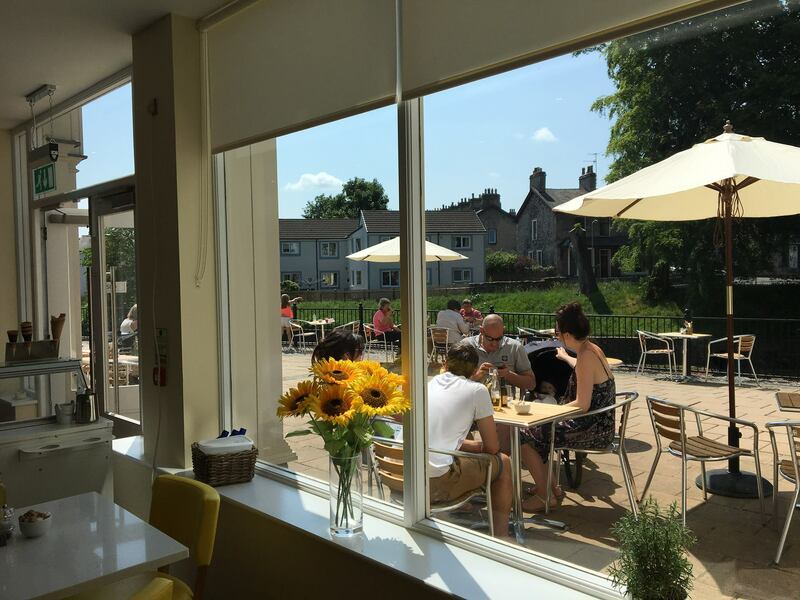 Find a seat on the balcony at The Tannery Bar & Bistro, situated within Kendal’s Riverside Hotel and enjoy tasty pub food with a great view. If you are celebrating a special occasion this summer, head to The Castle Dairy for a fine dining experience. The Castle Dairy is situated in a medieval structure, often considered to be Kendal’s oldest inhabited building. The restaurant is an apprenticeship academy, which trains catering students in the art of fine food. Treat a foodie lover to a unique experience this summer, with an evening class at The Castle Dairy and witness head chef Chris O’Callaghan demonstrate innovative cooking techniques. Neighbouring The Castle Dairy sits Eastern Balti, a well established dine in and takeaway restaurant specialising in Indian food. If you’re looking for hearty, cumbrian meals in a traditional community pub, head to the Castle Inn and discover their calendar of live music events this summer including an evening of dancing and singing with “Mainly Frank” on 24th August. Follow the river south from Castle Street down Aynam Road and you will reach Kendal’s The Factory Tap. With an outside terrace, quirky interior and a wide range of real ales available, it is easy to see why this establishment was voted Westmorland pub of the year in 2017. It is certainly worth venturing out of the town centre to visit The Factory Tap with regular street food evenings taking place over the summer months ranging from Thai to Caribbean. A bright and cheerful restaurant located on the banks of the River Kent, Terrazzo serves Tapas on Thursday evenings along with a special Fish & Chip night on a Fridays. Looking to explore more of Kendal? Don’t miss our Highgate, Stramongate and Stricklandgate blog posts for more great ideas and keep posted on our Light Nights page for more arriving soon.